Abstract: Among mediastinal tumors, thymoma, neurogenic tumors, lymphomas and germ cell tumors are more common. The clinical manifestations of mediastinal tumor vary according to tumor size, site and benign and malignant. Mediastinal tumor in children is common in clinical, with no typical early symptoms, lack of specificity, and generally increases with tumors appeared some symptoms such as chest pain, dyspnea, cough, so early diagnosis is difficult. 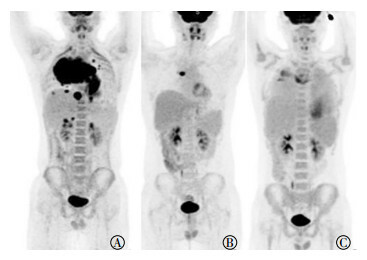 Two cases of mediastinal mass in children without specific clinical symptoms were selected, through its 18F-FDG PET/CT imaging features and clinical data for the differential diagnosis, summarize the diagnosis idea, in order to improve the imaging diagnostic accuracy. McCarten KM, Metzger ML, Drachtman RA, et al. Significance of pleural effusion at diagnosis in pediatric Hodgkin lymphoma: a report from Children's Oncology Group protocol AHOD0031[J/OL]. Pediatr Radiol, 2018[2018-07-05]. https://www.ncbi.nlm.nih.gov/pubmed/?term=30014200. DOI: 10.1007/s00247-018-4197-6. [published online ahead of print]. Tansel T, Onursal E, Dayloǧlu E, et al. Childhood mediastinal masses in infants and children[J]. Turk J Pediatr, 2006, 48(1): 8–12.